Add (or Edit) Rules: The area that enables to you add or edit an existing rule. This area is dynamic depending on the Rule Source Data you select. Note: If you want to remove the Start Rules for a given task, you can remove the transition line by selecting the delete button on your keyboard. Status By selecting Status, Integrify will present you with a list of all available tasks in the process and the corresponding available statuses that can be used for a Start Rule. Data By selected Data, Integrify will present you with a list of all available tasks in the process. By selecting any of the tasks, Integrify will then make available any data associated with that task, such as a question on a form or an Approval task option that may be used in the Start Rule. Requester, Client, Task Completer, Task Recipient, etc. Similar to using Dynamic Recipients for a Recipient on a task, you may also use the Dynamic Recipient to determine start rules. By selecting any of the Dynamic Recipients in the Source list you will be presented with a list of available attributes from that recipients Integrify profile. By selecting any option in the Source list, additional list(s) will be populated in the Rule Source Data area. For example, if the Data option is selected in the Source list two new lists called Task and Field will appear in the Rule Source Data area. The Field list is dynamic based on the Task selected. 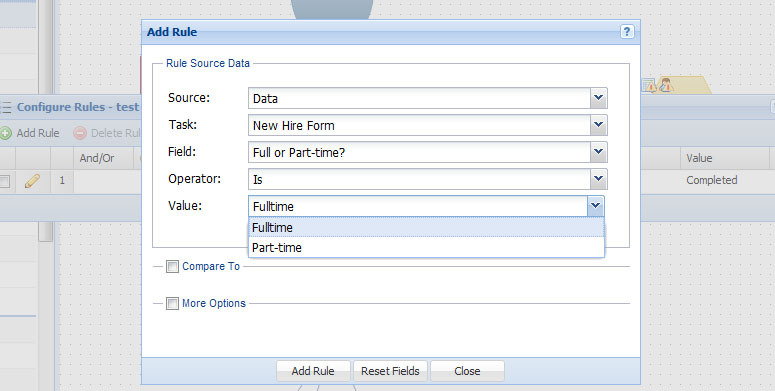 In this example, the New Hire Form task has been selected and the Field choice will contain all of the existing fields on the New Hire Form. Here, we selected the Full or Part-time? question and the value Fulltime. If this were an Approval task, you would be presented with the available choices for the Approval task. For this particular 'test' Approval Task, we only want it to execute if the user selects the Approved option that has been defined for that particular Approval task. As it stands, these two conditions together must resolve true for the task this particular task to execute. In other words, the 'test' Approval task will be started if theNeeds more information milestone task is Completed AND the result of the Approval task is 'Approved'. 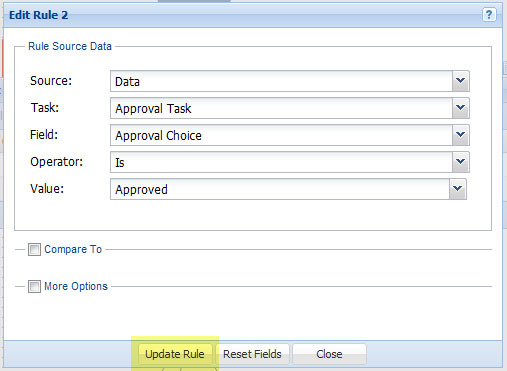 The Rule Source Data area will be pre-selected with the options originally defined for the rule. If you would like to make a change, do so and then press Update Rule. Note: It is not advisable to change the business rule(s) if this process has a Publish Status of Production and there are outstanding Requests executing the process definition. To accommodate for this type of scenario, it will be necessary to add the necessary status conditions and data conditions for the start rules for this task based on both the HR Approval and the Manager Approval task and also to group those rules so they are evaluated correctly. By grouping lines 1 and 2 together, it is effectively telling the Integrify workflow engine to evaluate those two lines as one condition. In this case we select Or from the list and press the Save Group Edits to commit the changes.